VIDEO: 28 Back to School Supplies for FREE or $0.01 + Deals at Target & CVS! VIDEO: Back to School $0.01 Supplies + FREEBIES at Target & CVS! 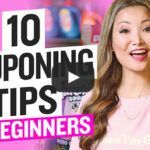 Watch Replay of My LIVE Video (5/22) – TOP 10 FREEBIES & Deals This Week! Watch Replay of My LIVE Video (5/15) – TOP 10 FREEBIES & Deals This Week! Watch Replay of My LIVE Video (3/27) – TOP 10 FREEBIES & Deals This Week! Watch Replay of My LIVE Video (3/20) – TOP 10 FREEBIES & Deals This Week!